TANMS graduate student, Zhuyun Xiao, has been awarded the 2017-2018 Distinguished Master's Thesis Award in Physical & Wave Electronics of the UCLA Department of Electrical and Computer Engineering. Her thesis, titled "Controlling Magnetization and Strain at the Micron-Scale and Below in Strain-Mediated Composite Multiferroic Devices," focuses on the TANMS 3D thrust's goal of realizing electrically-controlled, miniaturized magnetoelectric composite devices that are energy-efficient and compact for applications such as localized particle and cell sorting. The collaborative research work was carried out by a team of researchers from TANMS (including those from UCLA, UCB and Cornell University) and scientists at Advanced Light Source, Lawrence Berkeley National Lab in Berkeley. 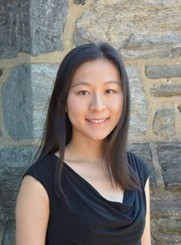 Zhuyun received her master's degree in Electrical Engineering from UCLA in 2017 and her bachelor's degree in Physics from Bryn Mawr College in 2015. She is currently a third year Ph.D. student in the Sensors and Technology Laboratory, advised by Professor Rob N. Candler in the UCLA Department of Electrical and Computer Engineering.